Hey, it’s Marie from Make and Takes here and I’m happy to be sharing a fun idea today for families who love to travel! We’re a big traveling family ­- we love to explore everywhere we can. You can usually find us at Disneyland, the beach, skiing in Utah or camping in the mountains. Our family is pretty good when it comes to flying. We’ve got our routine down to keep things as calm as possible, as my children’s energy is usually pretty high and excited when we fly. As we get all packed up, I make sure to have a variety of items all ready. Their backpacks are filled with things to play with on the airplane like a book or two, some coloring, and a few small toys that will fit in their pack. 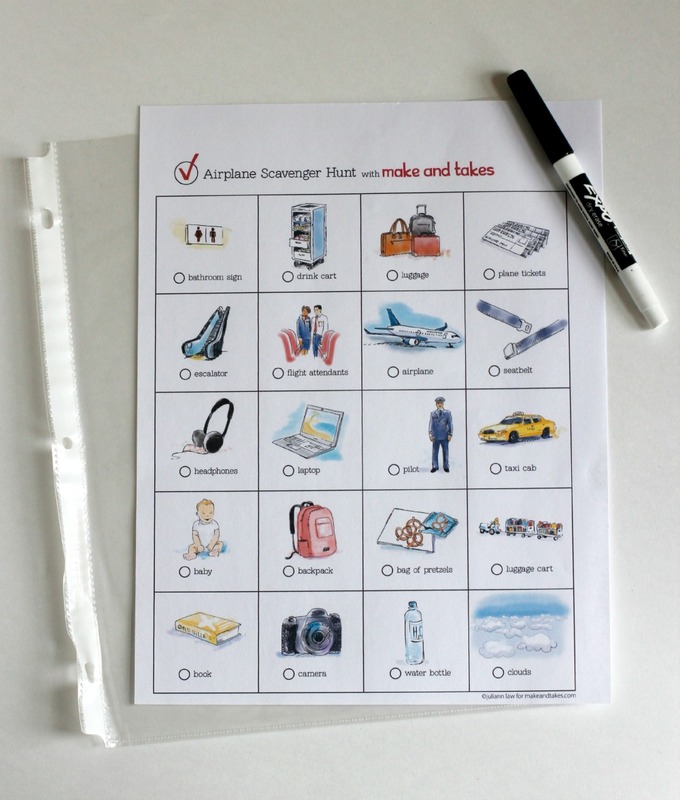 With upcoming holiday travel, I thought it would be fun to come up with a new game for kids to play, a little something extra during the flight with this Airplane Scavenger Hunt printable – designed by Juliann Law. 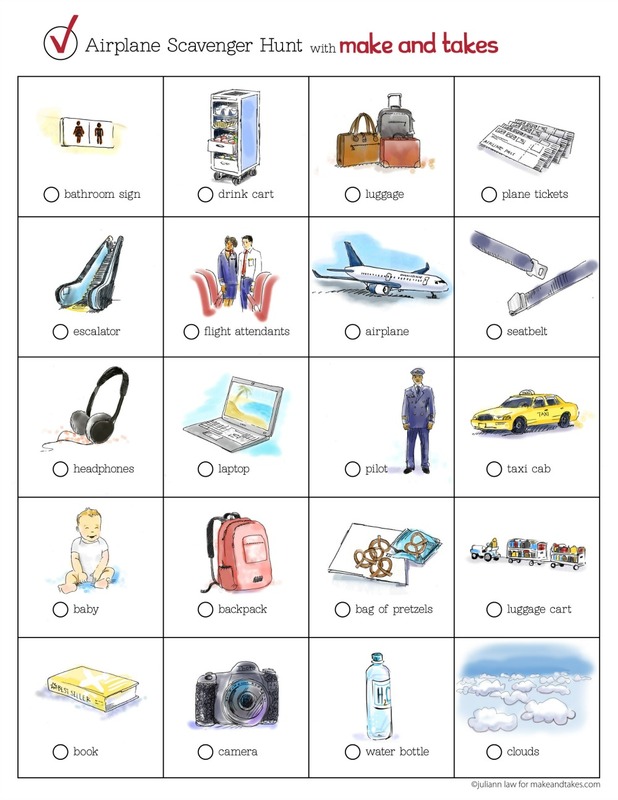 With this scavenger hunt, kids can get excited about arriving at the airport, waiting to board the plane, and flying as they search for all the items on the list! I like to print out the scavenger hunt and slip it into a plastic cover sheet so we can use it again and again. 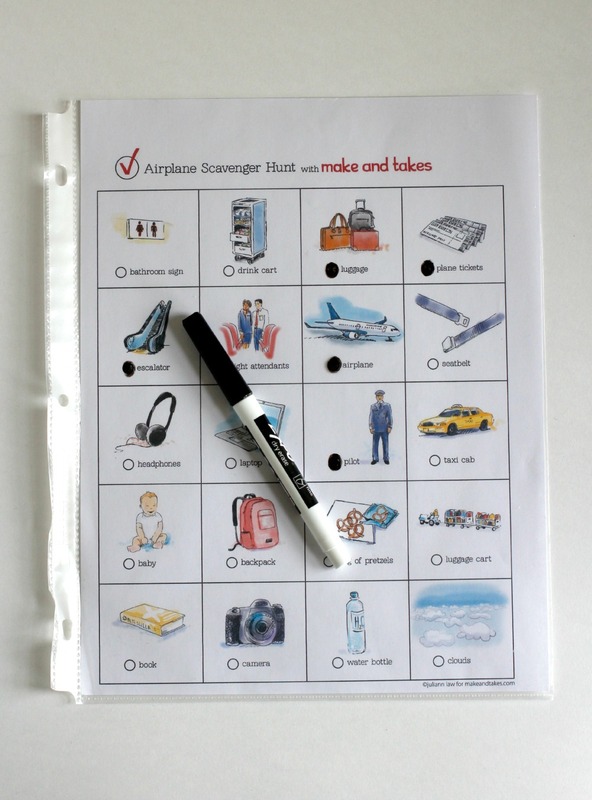 With a dry-erase marker, my kids can fill in the circles when they find the item on the paper. Then they can erase them with a tissue and play again! If you have younger children, you can write on the sheet for them with the marker or they can simply use crayons right on the paper. There’s also a black and white version so kids can color in all the items as well! To turn it onto a game for the whole family, you can print one out for each person to have their own. Play a type of bingo game, being the first to find four across or blacking out the whole board! Have fun finding all kinds of interesting things at the airport, and safe travels this holiday season!